Cannabutter, or marijuana-infused butter, is commonly used as the main ingredient to create cannabis recipes and edibles. If you have ever had a pot brownie or cookie, you have likely already ingested cannabutter, as it is the most popular method of creating marijuana edibles. This is because butter is the tastiest medium to transport THC – the active ingredient in marijuana that gives you a high – and it is also highly effective at preserving the natural effects of the cannabis plant. Because THC is fat-soluble, cannabutter can serve as a potent transporter—binding the chemical to the fat naturally found in butter. In this manner, the butter can preserve the marijuana during the cooking process, for a cleaner and longer-lasting high. Cannabutter is used both recreationally and medically is it can be baked into a variety of goods, or used on its own as a spread. Cannabutter baked goods and edibles offer many health benefits over smoking marijuana in a joint or bowl since you can achieve a cleaner high without any smoke or carcinogens involved. In addition, because butter is rich in saturated fats, cannabutter can bind the THC molecules and prevent them from cooking out while baking edibles. This allows you to create highly potent goods that can be used either recreationally or medically. In fact, only coconut oil has a higher concentration of saturated fats, but many experts complain that it is harder to use in recipes because of its denser consistency. In addition, many dislike the taste of canna-coconut oil and therefore opt for cannabutter instead. Experts typically agree that of all the fats and oils that are often used to create edibles, cannabutter produces the tastiest results. Cannabutter can be used as a substitute for virtually any a non-marijuana-infused recipe, allowing you to create a wide range of food options. *Instead of 1/2 ounce of ground cannabis buds, you could alternatively use 1 ounce of decarboxylated leaves, stems, and trims, but the results may not be as high quality. Step 1: Create a double boiler by filling your pot with water, placing your glass bowl on top, and allowing the water to boil over medium heat. Make sure that your glass bowl is not sitting in the water, as this will cause your butter to burn and your THC to cook out. Step 2: Add your stick of butter to the bowl and allow it to melt while stirring with your metal spoon. Step 3: Once the butter is completely melted, stir in your cannabis and mix in 1 cup of water. Allow the mixture to simmer over low heat for about 45 minutes, this is when the THC will bind to the fat cells in the butter. Note: The mixture should look green. Step 4: Place the cheesecloth over the aluminum foil container and slowly start pouring the mixture over top. Once the cheesecloth has cooled a bit, carefully squeeze it to reap the maximum potency from your cannabis infusion. Pro tip: you can use a pair of tongs to squeeze the cheesecloth to strain all the juice out. Step 5: Place the container in the freezer for about 30 minutes so that the butter can harden and separate from the water. Once complete, the butter should be solidified on the top but the water should still be liquid on the bottom. Step 6: Use a knife to make a small hole in the bottom of your aluminum pan so that the water can drain from the bottom, leaving behind your cannabutter intact. Step 7: Use a spatula to get all the butter out of the aluminum foil container and store in a different glass lidded container if desired, until ready to use. 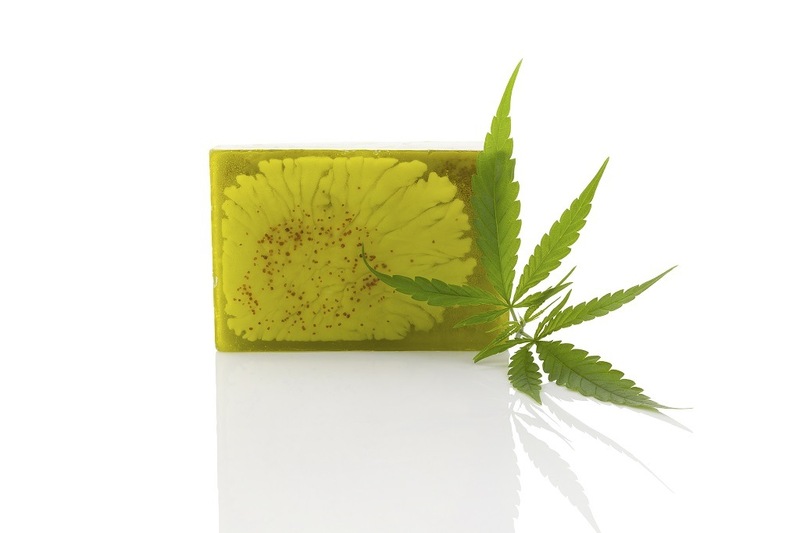 Now that you have your DIY cannabutter, you can use it to make all your favorite edibles! Cannabutter is the fat of choice for professional edible bakers because it is easy to mix into a variety of recipes and it effectively transports the THC without allowing it to get cooked out. Cannabutter can also be eaten by itself, by spreading it over a piece of bread or even putting it on a pancake. Photos from: eskymaks / depositphotos.com.